What’s the difference between affirmations that feel fake and those that actually work? How can you move your body in a way that also transforms your mind? What falls under the category of spiritual bypassing versus actual transformation? Join me for a conversation with one of my favorite New York friends, Erin Stutland, as we discuss her new book: Mantras in Motion: Manifesting What You Want through Mindful Movement. Are you getting sucked into endless scrolling in Infinity Pools like email, YouTube, Instagram and Facebook? It's okay, we all do. We all know these apps are designed to be addictive. After all, tech is the only industry other than drugs that calls its customers "users." It's so easy to look back on the day and wonder, "Where on earth did the time go?!" We've drained ourselves of all energy and yet often come up empty, feeling we have nothing to show for it. At least I'll speak for myself and say that's how I feel when inadvertently taking a ride on what John Zeratsky calls the "Busy Bandwagon." But what do we do about it? How do we "make time" without the same tired productivity principles that have only led to more exhaustion? John is co-author of a new book called Make Time: How to Focus on What Matters Every Day. We’re cut from the same corporate cloth—he worked at Google for 10 years at YouTube and Google Ventures, and has worked as a designer in the Bay Area for fifteen years before striking out on his own last year. I think you'll love this conversation for practical tips on finding more space and joy in work, and why the opposite of exhaustion isn’t necessarily rest. Daniel Aaron is a fascinating fellow seeker who describes his own journey as guided by a divine power, as he explores all variety of mystical and practical practices and shares them with thousands of others through yoga, sangha (community), and coaching. His mission is "to bring in a new era, where the new-normal is love and truth – kindness, authenticity and radiance – for all beings, of every species." I hope you enjoy the this week's conversation! Check out full show notes from this episode with links to resources mentioned at PivotMethod.com/podcast/daniel-aaron. Enjoying the show? Make my week by donating just $1 and episode at Patreon.com/pivot. Daniel Aaron is a teacher, writer, and human potential coach with a half century of joyous seeking and more than 25 years of experience in yoga and personal transformation for thousands of others. 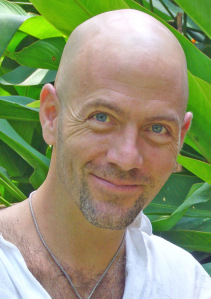 Creator of the world-recognized Daniel Aaron Yoga Teacher Trainings in 2005, Daniel also founded the Radiantly Alive Yoga studio in Ubud, Bali in 2012. He is a seeker of wisdom, mystical and practical, and how we can apply it to radically upgrade our lives. From enlightened gurus to the deepest therapists, cutting-edge nutrition, fasting and cleansing Ashrams, centers and caves, Maine to Bali (with a few hundred vistas along the way), he has lived everything from an excruciating childhood (which was also full of love) to helping others find everyday, guaranteed joy and entrepreneurial brilliance (including his own massively painful lessons and mistakes). His chaotic childhood upbringing, a crucial realization at three years old: “There’s got to be more than this"
His mission is to bring in a new era, where the new-normal is love and truth – kindness, authenticity and radiance – for all beings, of every species. Check out other episodes of the Pivot Podcast here. Be sure to subscribe via iTunes, Google Play or SoundCloud, and if you enjoy the show I would be very grateful for a rating and/or review! Sign-up for my weekly(ish) #PivotList newsletter to receive curated round-ups of what I'm reading, watching, listening to, and new tools I'm geeking out on. Want to support the show and become a founding member of the Pivot Podcast community? Join us on Patreon here. 121: Raise Your Game (and Ditch Compare-and-Despair) with Alan Stein Jr. I am beyond lucky to have the brilliant Petra Kolber as one of my best friends in New York City, and just delighted to celebrate her book launch this week!! It's been a long journey, and one that forced her to confront the very message of her book: overcoming the inner critic and imposter syndrome because "the world needs your voice, not your perfect silence." As I wrote in the show notes for our first Pivot Podcast interview in January 2017, Petra just radiates joy and truly walks her talk. When she enters a room, it lights all the way up with her positivity, passion for life and joie de vivre. But that doesn't mean she hasn't wrestled with her own dragons, particularly around perfectionism (as have so many of us). Coming from decades in the fitness industry, Petra struggled with the pressure to be perfect in looks, body, business, and beyond. As a two-time cancer survivor, she is passionate about waking people up to the precious gift of time. Her mission is to inspire people to move more and to fear less, so they can stretch their dreams, strengthen their courage muscle, and build an inspired life full of joy and gratitude. In this follow-up show we explore her book publishing process ups and downs, moving past the mirror, the platinum rule (a favorite new concept!) of self-compassion, and much more. So I was every bit as excited when they mentioned another one of their artists' ambitious projects: Amanda Giacomini's mission to paint 10,000 Buddhas around the world. Amanda has been teaching yoga for over 25 years, and she’s been an artist for almost the same amount of time. Ten Thousand Buddhas is her worldwide, highly sought after art project—including large scale murals and fine art paintings—that she completed last year after five years of steadily working toward her goal. In this conversation we dive into what she learned, how it inspired her to break out of her typical shell (and artist studio), and naturopathic practices that keep her sane while touring with her husband MC Yogi. I'm so grateful to Brooke Siem for opening up and sharing her story with us this week. Not only is she a woman of many talents (ballerina! chef! Chopped champion! bakery owner! crossfitter! writer! ), Brooke has spent the last two years sober. Sober from medications that doctors, the assumed authority figures of her life, had been prescribing for the last fifteen years and an estimated 30,000 pills. It all stemmed from an attempt quell her initial grief at the sudden death of her father when she was just a teenager. Brooke assumed she was broken, that she couldn't function in society without the drugs. It was only recently that she began to question what life would—or could—be without these medications driving modulating her emotions. Listen in to this week's conversation for how Brooke is navigating her newfound life—re-learning what it means and how to be herself, if not truly figuring it out for the very first time. Check out full show notes from this episode with links to resources mentioned at PivotMethod.com/podcast/brooke-siem. Enjoying the show? Make my week by donating just $1 an episode at Patreon.com/pivot. Brooke Siem is a speaker, writer, and chef who spent a eight years in the New York City food and wine industry before an opportunity to travel around the world with Remote Year fell into her lap. Despite a career that included honors such as being named one of Zagat's 30 Under 30, becoming a Food Network "Chopped" champion, and co-founding Prohibition Bakery and authoring the book of the same name, Brooke's "successful" Manhattan life also fueled a lifelong battle with depression. Prescribed antidepressant and anti-anxiety drugs at 15 years old after her father's sudden death of pancreatic cancer, the opportunity for a life abroad sparked the realization that she had been heavily medicated for half of her life. She decided to make a massive change. First, she booked a one-way ticket to Malaysia. Then, she got off all the prescription drugs. Two years and 17 countries later, Brooke's primary focus is on advocating for mental health and wellness without the use of antidepressants and anti-anxiety drugs. Though she believes that these sorts of drugs can have their place on the road to healing, her own experience has taught her that these medications are often poorly monitored by doctors, prescribed without thought of the long term consequences, and prioritize the notion of "existing" versus thriving. Brooke's goal is to show that it is possible to live a joyful, centered life without the use of antidepressants, no matter how far down the rabbit hole we once were. As of May of 2017, Brooke sold her half of Prohibition Bakery in order to continue working and writing remotely. She is currently working on her second book, a memoir, and is currently based in Vancouver, BC. You can also say hi on Instagram, Facebook, and Twitter. In her Legacy Show talk she shared, “When they first put you on the drugs, they don’t tell you that you’ll forget how to feel." It was love at first listen when I first heard Mandy Harvey perform at a fundraiser for Erik Weinenmayer's No Barriers summit coming up here in New York City in October. Erik, a previous guest on the Pivot Podcast (Turning Pain Into Purpose: Blind Adventurer Erik Weihenmayer on Kayaking the Grand Canyon, Climbing Everest and Building No Barriers), said Mandy was a must-meet, and he was right. Her performance was exquisite, and I was mesmerized by her signing while singing and sharing her inspiring story with the audience. With lifelong dreams of being a musician and music teacher, Mandy was devastated to lose her hearing completely ten years ago during college. You might already know her story if you are one of half a billion (with a B!!) people who have watched her America's Got Talent audition—that's a MUST before you even listen to this episode. I cried when Simon Cowell asked what motivated her to be there, and she said at “After I lost my hearing I gave up. But I want to do more with my life than just give up.” I assure you, there was not a dry eye in the audience either as they give a standing ovation midway through, including the judges! Even Simon came out of his curmudgeonly shell to say, "I’ve done this a long time and that was one of the most amazing things I’ve ever seen and heard.” I hope you enjoy this conversation with Mandy as much as I did—which she did with the help of a live captioner while we were on video Skype. I know what it’s like to look in the mirror and hate who’s looking back, to feel like you have no control whatsoever over your mind or your life, to feel like you’re so broken that you’re beyond healing. I’ve struggled with clinical depression, Obsessive Compulsive Disorder and eating disorders throughout my entire life. In fact, they almost killed me. I hit rock bottom in 2005 when I was hospitalized on suicide watch. Having my freedom stripped from me in that hospital shocked me back to life: it hit me that I’d given up. I’d never even tried to take action to feel better because I just assumed that nothing would ever work for me. With this realization fresh in my mind, I committed to working on myself from the inside out as soon as I was released. After all, the worst had already happened. I figured I had nothing else to lose. Amy's recovery, and the mindset and methods she developed that created a true sense of freedom, are what we'll cover in this week's show, along with some of her recent business pivots. I am over-the-moon to bring you this week's interview with Sy, who became an instant soul-friend the moment we started talking. I'm in awe of her career as a naturalist writing about and befriending pigs, tigers, dolphins, hyenas, and now octopuses (not octopi as many assume for plural form!) around the world. I love her passion for animals, and the heart with which she shares their beautiful stories and spirits. For her recent book (the one that inspired me to reach out), The Soul of an Octopus, a National Book Award finalist, Sy befriended octopuses at the New England aquarium and scuba dived and snorkeled with wild octopuses in Mexico and French Polynesia. We also talk in detail about The Good, Good Pig: The Extraordinary Life of Christopher Hogwood (2006), a memoir about her 14-year relationship with her pig who grew to be 750 pounds, famous within her town of Hancock, and beloved by all who met him. At the end, we briefly dive into her routines for such prolific writing while traveling, and her practice of reflecting beyond the details of what happened to "what that day showed me." "My father had been like a broom, constantly sweeping me out into the world, and my mother was like the dustpan gathering up the shattered pieces and rebuilding me, only to have my father sweep me out again." This week's guest, Erik Weihenmayer, needs no introduction beyond his incredible life story and mission, and I cannot wait for you to meet him. Erik is an adventurer, author, activist and motivational speaker, who has also become a celebrated and accomplished athlete despite losing his vision at the age of 13. He was the first blind person to reach the summit of Mount Everest, on May 25, 2001, and completed the Seven Summits the following year, joining 150 mountaineers at the time who had accomplished that feat, but as the only climber who was blind. In 2005, he co-founded No Barriers, a nonprofit organization with the tagline, “What’s within you is stronger than what’s in your way.” The organization helps others with diverse backgrounds and abilities attack challenges head on, problem solve, build winning teams, and serve others. In September 2014, Erik and blinded Navy veteran, Lonnie Bedwell, kayaked the entire 277-miles of the Grand Canyon, considered one of the most formidable whitewater venues in the world. That’s the focus of his recent book, No Barriers: A Blind Man’s Journey to Kayak the Grand Canyon. In the foreword, Bob Woodruff said, “Erik is simply one of the most remarkable men I have ever met.” I agree, and not just for what he has accomplished, but for who he is—full of heart, soul and inspiring hustle. This episode is one you won't want to miss.